Work with concrete contractors who have the experience to do the job right. Pouring concrete is no simple task. Instead of trying to figure out how to do it yourself, work with our concrete contractors in the Nashville area to bring your idea to life. We have the experience and know-how you need for a project as large as concrete pouring — contact A-1 Concrete Leveling and Foundation Repair today for a free estimate. It’s Saturday morning, you’ve watched a few DIY videos on YouTube on how to pour concrete, you have all the materials, and you’re ready for what the day will bring. Go ahead and stop while you’re ahead. There are plenty of blogs and videos out there that say you can create concrete slabs yourself. Take it from the concrete professionals, though: it’s better to rely on us. Doing it yourself may give you a sense of satisfaction at the successful completion of the project, but more often than not it leads to accidents, higher costs, and more stress — all of which wouldn’t have happened if you had come to A-1 Concrete Leveling and Foundation Repair first. Prepare The Site – We’ll help determine regulations, required permits, and how close you can build to your lot lines. We’ll flatten or build up your ground to make it even. Sandy, dry soil is preferable, but we’ll scrape off sod and topsoil otherwise and add compacted gravel. Build Level, Strong Forms – For concrete pouring to work well, we’ll need completely straight boards for the perimeter. Freshly poured concrete can push form boards outward and give your concrete slab a curved edge, so leave this to experienced concrete contractors. Build Up The Base And Pack – Rebar will be our best friend here. We’ll cut, bend, and splice the rebar so it fits just so within the perimeter for the concrete slab. Pour And Flatten Concrete – The big moment is here! Concrete is too heavy to push even a few feet, so we’ll pour it close to its final spot, level it with a rake, and then smooth it with a form board. Get A Smooth Finish – Finally, we’ll get you that smooth slab you want by performing concrete finishing, which involves floating and troweling. Something great about concrete slabs is that you can let your creativity reign and create whatever you want! If you can dream it, we can most likely do it. 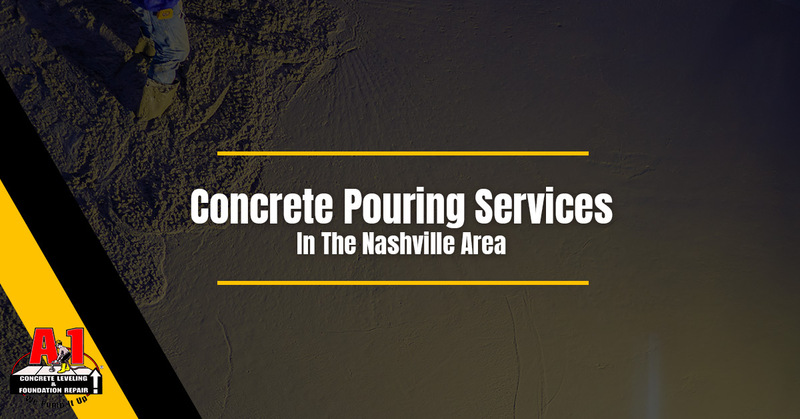 With all of these concrete pouring services, we guarantee a smooth, even, long-lasting surface. Concrete Patio – When it comes to pouring concrete, one of the most common services we perform is making concrete patio slabs. Enjoy your backyard in Hendersonville, Franklin, Goodlettsville, Burns, and beyond when you have a new concrete patio. Concrete Base For Shed – Nobody likes a shed that isn’t doing its job of keeping the moisture out and the items inside safe. Concrete pads for sheds will increase the safety of whatever is in your shed and make it less susceptible to the uneven ground. Concrete Basketball Court – Have kids that want to play basketball? A new court will ensure the ground is level, so you can truly level the playing field. Concrete Garage Floor – Protect your cars, have an even surface, and keep out moisture with a concrete garage floor. Pouring a concrete slab for garage floors is another of our most common services. Concrete Driveway – Perhaps your driveway and your basketball court are one and the same! If not, though, then pouring a new concrete driveway will be one of the best ways to turn up the curb appeal and enjoy your home. We, of course, also can pour concrete for sidewalks and foundations. At A-1 Concrete Leveling and Foundation Repair, we’re largely known for just that — concrete leveling and foundation repair. 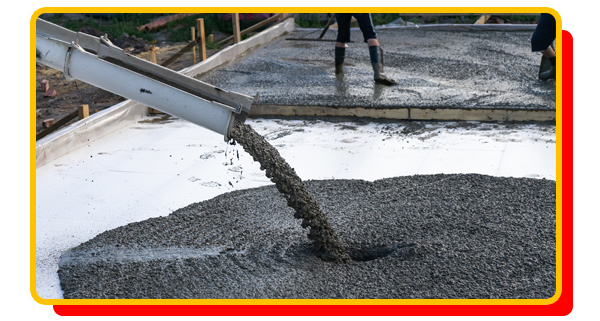 If concrete repair would work better than a new concrete pad or concrete pouring services, then we’ll let you know and give you the best service for your needs. We’re a Top Rated Local® in the Nashville area, and we have plenty of testimonials about our superior services. When you use our concrete contractors for concrete pouring, we’ll help you through the process, answer your questions, and have you enjoying your new home and concrete slabs in no time. Contact us today to get started!